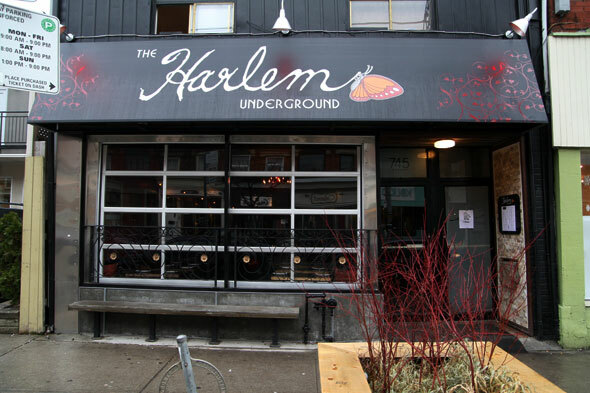 Harlem Underground is the latest addition to chef Anthony Mair's soul food mini-empire, taking over the space from his previous Irie Food Joint and joining Richmond Street's Harlem Restaurant on the scene. 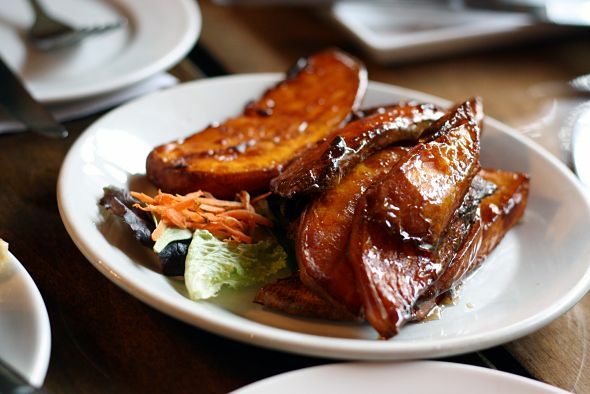 I went by with some friends to satisfy a Sunday evening craving for something rich and comforting, and we weren't let down. 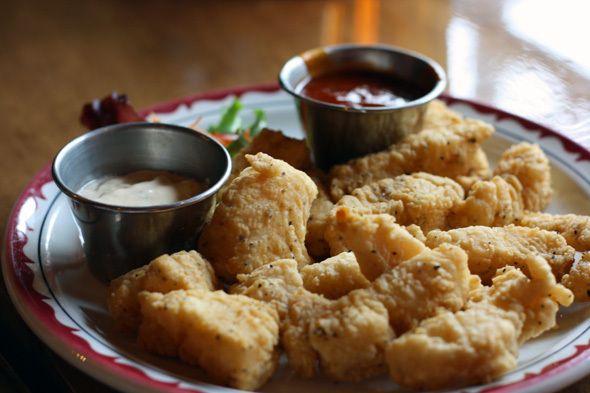 We started by sharing a plate of catfish Lafayette ($9), breaded and deep fried morsels of catfish served with barbeque sauce and jerk scallion mayonnaise for dipping. Catfish is about as mild a fish as you can get, so this dish is really about dipping deep fried breading, though the catfish did add some light, flaky texture. 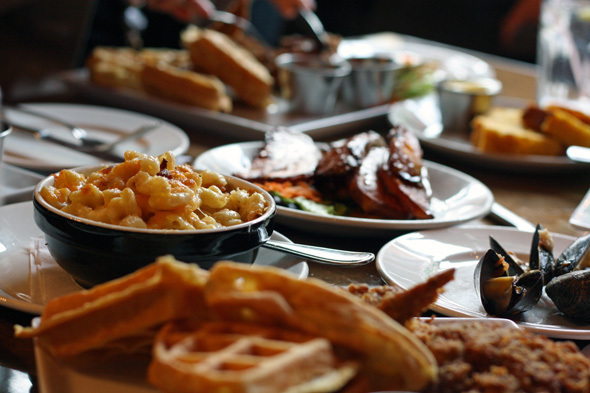 The mains at Harlem Underground are all served a la carte (i.e. sides are ordered separately). We dove in and ordered a whole pile of them -- because having to choose between corn bread and deep fried pickles is a decision I hope I never have to make. 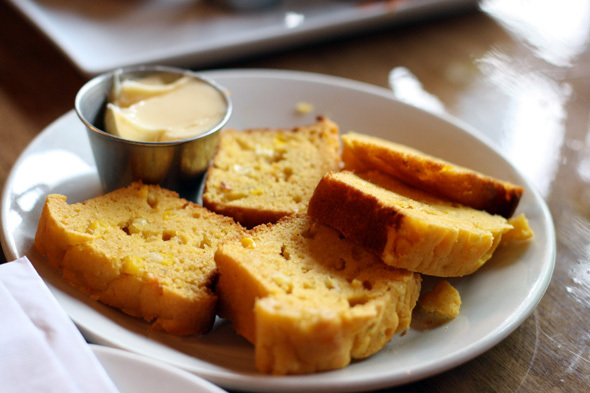 The corn bread ($4) was mildly sweet, dense and good. 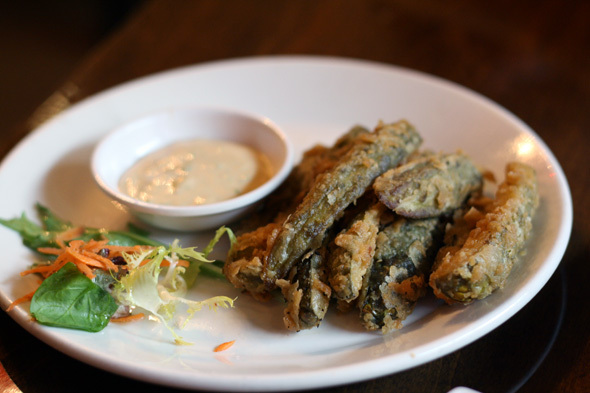 Deep fried dill pickles ($3.50) provided another opportunity to dip into some of that tasty scallion mayonnaise but were crunchy, sour and great on their own at a very reasonable price point. Big slices of candied yam ($5.50) were starchy and sweet, with awesome little bits of chewy caramelized sugar around the edges. We also tried the bacon mac and cheese ($6), which was creamy and satisfying. We split a bowl, but doing so strained the civility at our table as we got down to the last few bites. 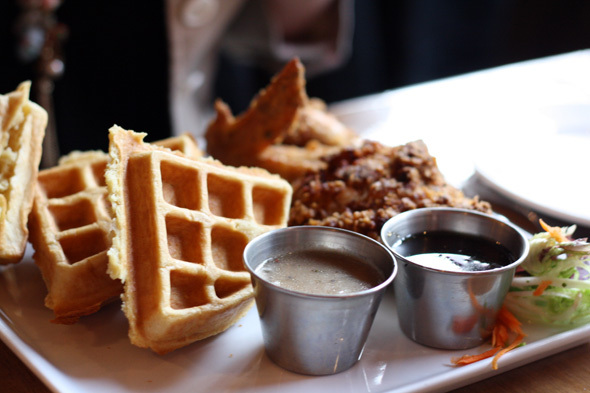 For our mains, we couldn't resist trying Harlem Underground's take on fried chicken and waffles ($15), a dish so brazen in its contempt for health that it should come with an insurance rate hike. The fried chicken was perfectly executed -- juicy, tender meat covered in a thick, crispy batter -- served with some top-notch white chicken gravy and coriander-lime maple syrup. The waffles were a little on the cool side by the time we got them, so they didn't match the standard set by the chicken. Still, there's something about topping fluffy waffles with crispy fried chicken, gravy and syrup that is so wrong, and yet so very right. 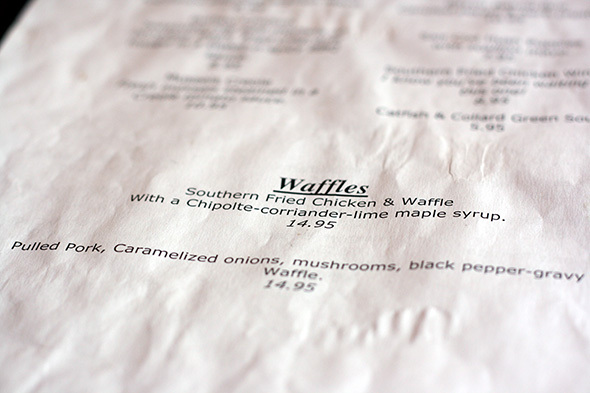 The meat-and-waffles section of the menu also includes a pulled pork option ($15). 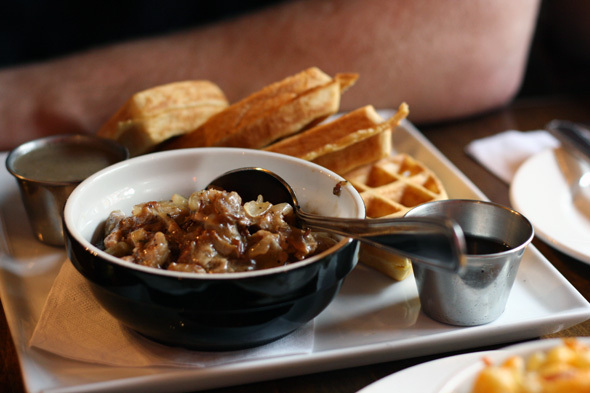 The pork is served in a bowl with a liberal supply of caramelized onions. While the overall flavour was good, the meat was fatty and the bowl we received had a few bits of bone in it, which didn't make for a great overall experience with the dish. 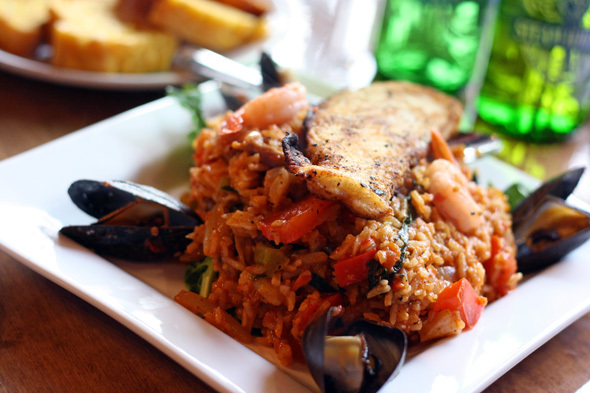 The jambalaya ($19), on the other hand, was a third-deck home run. Man, it was good. The rice was packed with huge flavour and a spicy punch, not to mention the big chunks of crab, shrimp and chicken. The plate is topped with a filet of blackened catfish and four plump, tasty mussels, while vibrant red pepper and greens add texture. 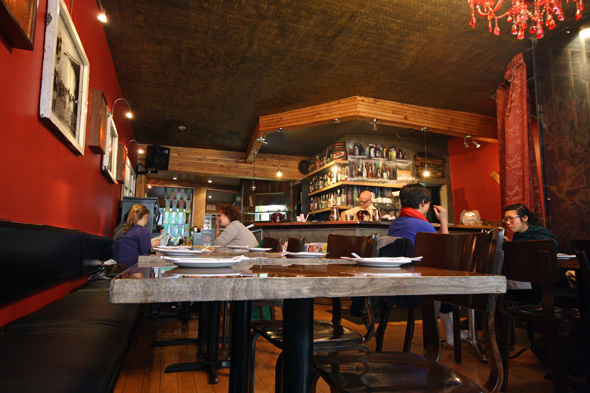 Aside from a few qualms, our meal at Harlem Underground was full of big, bold, delicious food and friendly service. And while all that deep frying and gravy may not be great for the heart, it sure is good for the soul.